Cropped view of page in 1860 Rogers Brs. Mfg. Co. design catalogue. Reproduced in The elegance of old silverplate and some personalities (1980). See entry below. "[In] 1853 a new company, Rogers Brothers Manufacturing Company, was formed. William [Rogers] was President and both he and [Asa] Rogers, large stockholders. Simeon [Rogers] became a stockholder a few months later. They erected a four story, brick factory to suit their particular needs at the corner of Trumbull and Hicks Streets [in Hartford]. In 1856, for reasons not clear, William left the firm (although remaining as a director and stockholder) and with George W. Smith... organized Rogers, Smith and Co.". — Edmund P. Hogan in The elegance of old silver plate and some personalities (1980), pp 166-67. Photo - National Museum of American History, Smithsonian, Washington, DC. 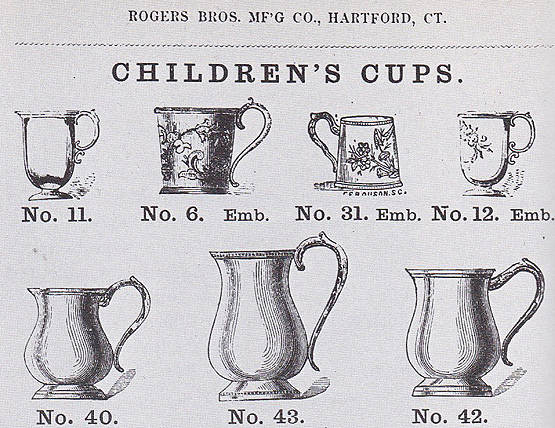 Click the following link to see designs and documentation for other historical silver companies that were connected to the International Silver Company and its predecessor companies, including other "Rogers" companies, as well as others from the Meriden area; go to the historical Meriden design overview page and scroll down to section B: "ISC, predecessors & divisions" and C: "Other featured companies". Rogers Bros Mfg Co. (undated). Sugar bowl. Silver or silver plate. (Dating by holder does not align to perceived dates of this company, as indicated by the marks on the designs.) Object no. H 30185.001-002. Viewed 30 June 2018. A03032-33). Rogers Bros Mfg Co. (undated). Syrup pitcher. Silver or silver plate. (Dating by holder does not align to perceived dates of this company, as indicated by the marks on the designs. Object no. H 30190. Viewed 30 June 2018. A03041). For documentation, see the design catalogues and historical information section below. 1858 (specific dates unknown). Connecticut State Agricultural Society. Rogers Bros. Hartford. Mention - May, Earl Chapin. (1947). A century of silver, 1847-1947, p. 368. ["Bronze medal awarded to Rogers Bros. Mfg. Co."] Yale University Library, call no. Jke33 C8 947M. See worldcat.org for other locations. Offline - (14 October 1853). Crystal Palace exhibition: Contributions from Connecticut class 3... Hartford Courant, p. 2. See worldcat.org for other locations. Offline - (11 October 1855). The State Fair: Second day... [with mention of unspecified designs, "Silver and plated ware, a very large assortment", exhibited by Rogers Brothers Mfg. Co.] Hartford Courant, p. 2. (Viewed 6 November 2018. C00330). Connecticut Historical Society, Hartford, call no. 739.2283 R731p, 1857. Yale University Library, call no. Jke33 C8 947M. Offline citation - Hogan, E. P. (January-February 1971). The old-fashioned dinner caster. Spinning Wheel, pp. 20-22. "Meriden - Industries - Silver" file, Meriden Public Library, CT.
> Wilcox Silver Plate Co.: caster (1871). > Also Bergen & Niland; Meriden Flint Glass Company; Meriden Silver Plate Co.; Rogers, Smith & Co.; Simpson, Hall, Miller & Co.; Wm. Rogers Mfg. Co. are mentioned. On Rogers Bros. Mfg. Co. - 1: designs in collections, etc. | 2: design catalogues, etc.